CHARLESTOWN, NEVIS — (Friday, November 18th, 2011) Premier of Nevis, the Hon. Joseph Parry visited the Caribbean Development Bank (CDB) Headquarters, and met with CDB President, Dr. William Warren Smith, and other top officials during his recent visit to Barbados, November 7th-10th. He was accompanied by Principal Education Officer, Mrs. Lornette Queeley-Connor. 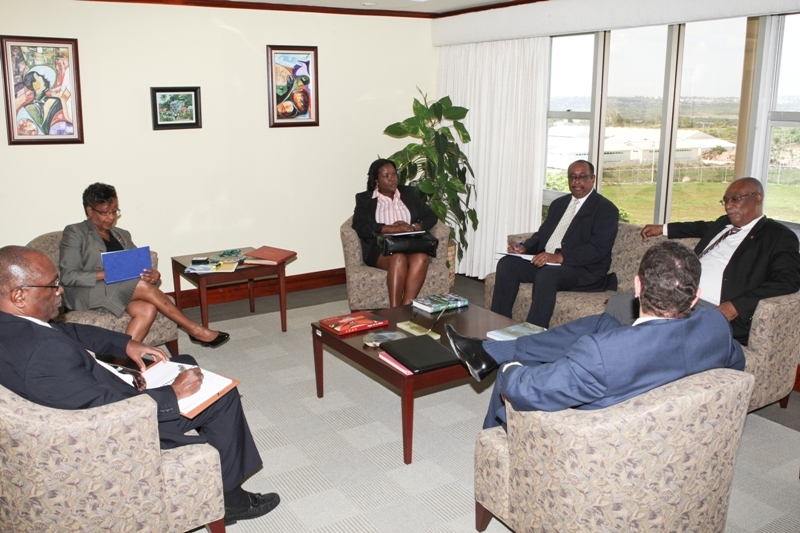 The Premier briefed the CDB officials on the latest developments in geothermal energy on Nevis as they relate to the US EX-IM Bank, West Indies Power Ltd. (WIP) and Wanova Bank. “I informed the officials of the CDB about the challenges and obstacles the Nevis Island Administration faces in relation to geothermal development due to the poor state of the global economy. They were very complimentary of Nevis’ efforts to go green, and said they will follow keenly the progress of the Nevis geothermal project,” said Mr. Parry. According to the Premier a number of other issues were also discussed, including the proposed electricity project, the water development project and the basic education project. The CDB officials indicated their satisfaction with the water project which will begin next year. “The purchase of generators to run the water supply when electricity goes off was discussed as part of the NEVLEC project, and the CDB officials agreed that it would be a positive development for the island, said Premier Parry. The Hon. Joseph Parry explained that the purchase of the generators would not interfere with the building of the wind farm or the development of geothermal energy, because there has to be a mix of energy supplies on Nevis. The Premier said the meeting was very successful, and he will keep the lines of communication open between the Nevis Island Administration and the CDB.